Lymphatic Drainage may sound scary! But it’s actually very simple and mimics a massage! In the body the Lymphatic system is responsible for moving the fluid around the body and from our tissues. It also helps remove and transport fatty acids from the digestive system. 33% of the Lymphatic System is in the face! By massaging the face mechanically we stimulate the lymphatic system. This eliminates toxins and helps promote nourishment in the skin. What Does Lymphatic Drainage Do? By mechanically massage the areas such as the chin and neck we stimulate the flow of the lymphatic system. By eliminating these toxins and helping old stagnant cellular fluid to drain out of the body we are promoting nourishment of our skin. As we are renewing the fluid in our skin we help the skin look fresher and more vibrant. As we are helping to renew our system repeat treatments can also help our metabolism! How Do We Do Lymphatic Drainage with the HydraFacial MD? 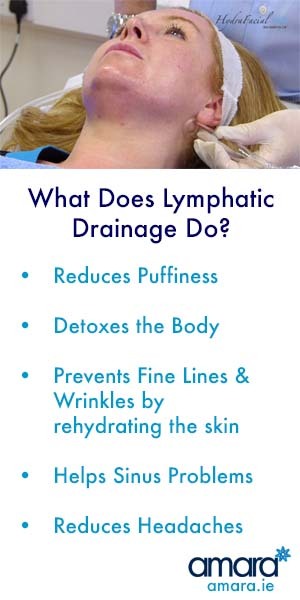 Lymphatic Drainage is actually quite simple and easily added to your HydraFacial MD as the first step! After your face has been cleansed you can relax and enjoy your treatment. Using light suction – glass cylinders are used to massage your face. In gentle upward motions the suction is used first on your neck bringing it up to ears. We use upward motions on the face as we never want to encourage the face to go down! This only takes about 3 -5 minutes and is then followed by the rest of your HydraFacial MD treatment. Do you want to add massage to your skincare routine? Book in now for your Full Skin Care analysis as well as your Full HydraFacial MD treatment with Lymphatic Drainage!